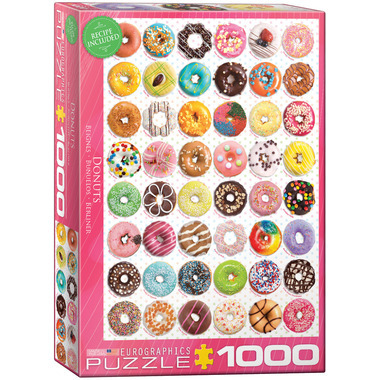 Enjoy putting together this puzzle with 48 donuts and zero calories! Recipe included on the back of the box. Strong high-quality puzzle pieces. Made from recycled board and printed with vegetable based ink. This superior quality puzzle will delight and educate all at the same time. Love the picture. Nice and large which means hours of fun! Great puzzle! Definitely a lot of pieces, but the ability to sub-divide the puzzle into smaller parts meant everyone in the family enjoyed putting this together (kids aged 3 and 6).